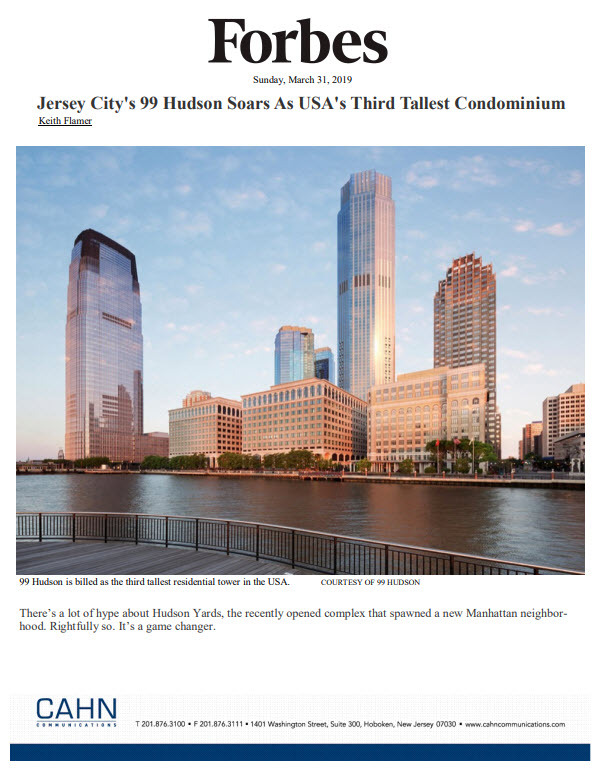 JERSEY CITY, NJ, April 19, 2017 – A nearly-completed 45-story residential tower in downtown Jersey City now has a name and a launch timeline. Fisher Development Associates has chosen the name Vantage for its striking new glass curtain wall building and announced a late spring opening for the property’s 448 modern rental residences. The developer has also launched a teaser website at www.VantageJC.com and tapped Manhattan-based The Marketing Directors to oversee the building’s leasing program. Vantage has been designed by S9 Architecture. Located at 33 Park View Avenue adjacent to Jersey City’s charming Paulus Hook and Van Vorst neighborhoods and minutes from Manhattan via PATH and ferry service, Vantage will feature spacious studio, one- and two-bedroom residences with floor-to-ceiling glass windows to maximize sweeping views of the Hudson River, Manhattan skyline and the Statue of Liberty. Residents will also enjoy a full suite of indoor and outdoor social and recreational amenities, including a 24-hour Concierge, outdoor zero entry swimming pool and a cyber café. Homes are expected to be initially priced from $2,115. Vantage will officially open with an onsite leasing center and fully-furnished model apartments. Additional details will be revealed on the website in the coming weeks. Prospective renters can be placed on a VIP Wait List by visiting www.VantageJC.com or calling 201-333-1222.